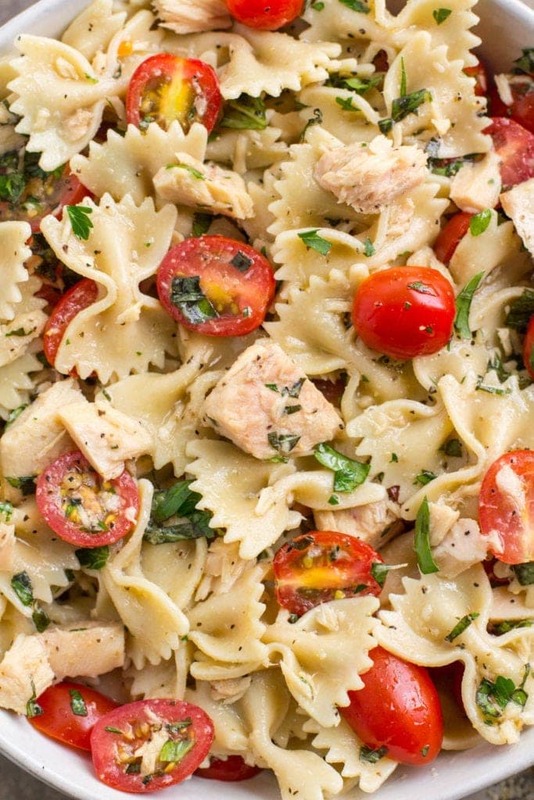 Healthy Tuna Pasta Salad is a delicious, lighter lunch! 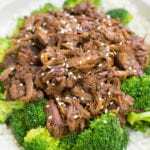 Made with only 10 ingredients, high in protein, and low in fat – it’s the perfect easy meal! Thank you Wild Selections® for sponsoring this post. 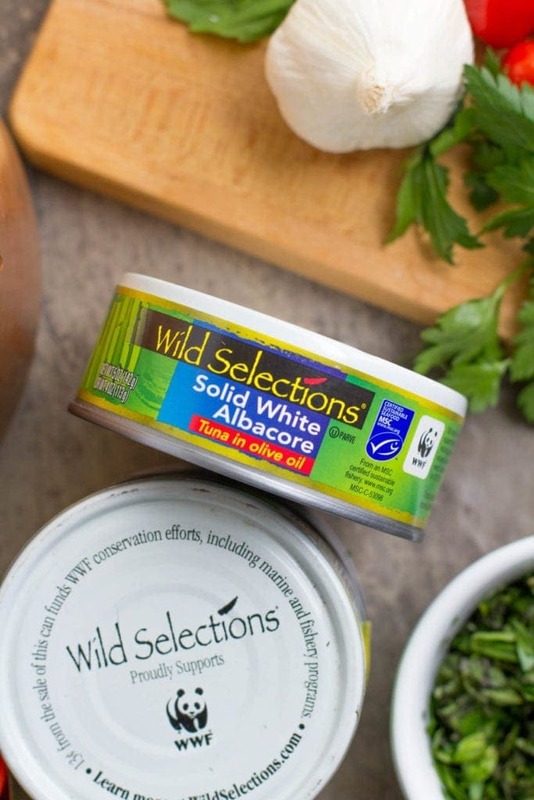 For a more sustainable meal, be sure to check out Wild Selections® premium seafood — it’s always healthy, always Marine Stewardship Council certified, and always delicious! You can click the tags in the above image to shop Wild Selections Tuna! One of the most common responses I get when I talk about meal prepping is ‘I just don’t have the time’. I’m taking care of that excuse for you today with this Healthy Tuna Pasta Salad Recipe! 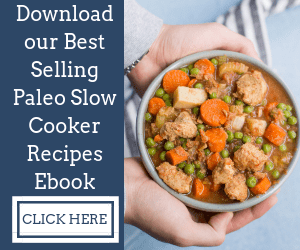 When it comes to making healthy meals – it doesn’t always have to be a gourmet recipe with a million steps. 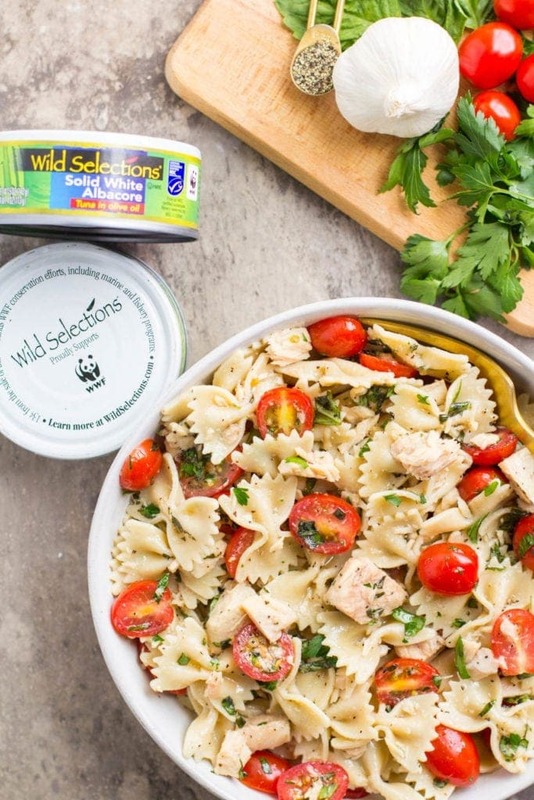 This Healthy Tuna Pasta Salad is much lighter than your traditional, mayo coated pasta salad and pulls it’s flavor from simple ingredients like fresh herbs + sweet cherry tomatoes! 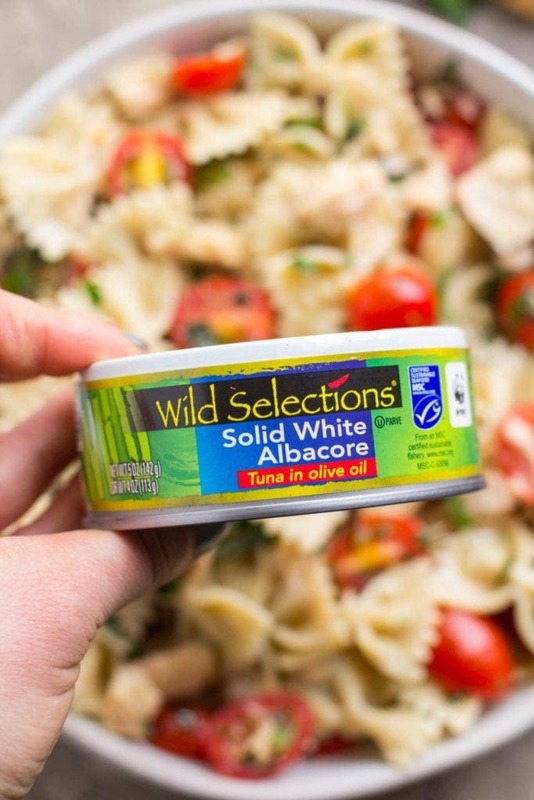 The real star of the show is the Wild Selections Solid White Albacore Tuna in Olive Oil. 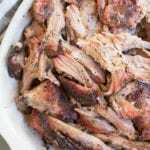 It adds a ton of protein to the dish, making it a complete meal! For years, we have strayed away from enjoying tuna because so many brands have questionable practices + ingredients in their products. Whether it’s funky oils, or lack of knowledge on sourcing – it’s very challenging to find the best option. When I was introduced to Wild Selections by a friend, I was really excited! They source wild-caught seafood – only from ocean areas that have been certified sustainable to the Marine Stewardship Council (MSC) Standard. In addition to being sustainably sourced, the tuna tastes amazing AND you can trace it back to the ocean where it was caught which is so cool! The only ingredients are tuna, olive oil + salt – so the flavor of the fish can really come through, and it’s clean ingredients make it perfect if you need something quick for a healthy snack. 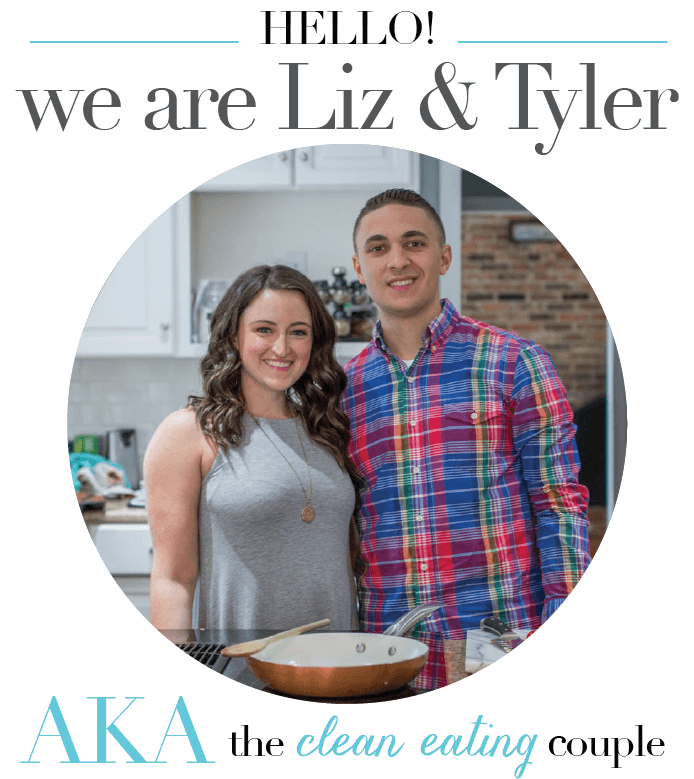 With Spring and Summer on the horizon, I’ve been all about the light + fresh meals. This Healthy Tuna Pasta Salad is perfect for enjoying as a quick lunch or dinner, or prepping for your week. 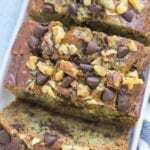 It’s loaded with flavor, so quick to make + was a huge hit with everyone that I shared it with! 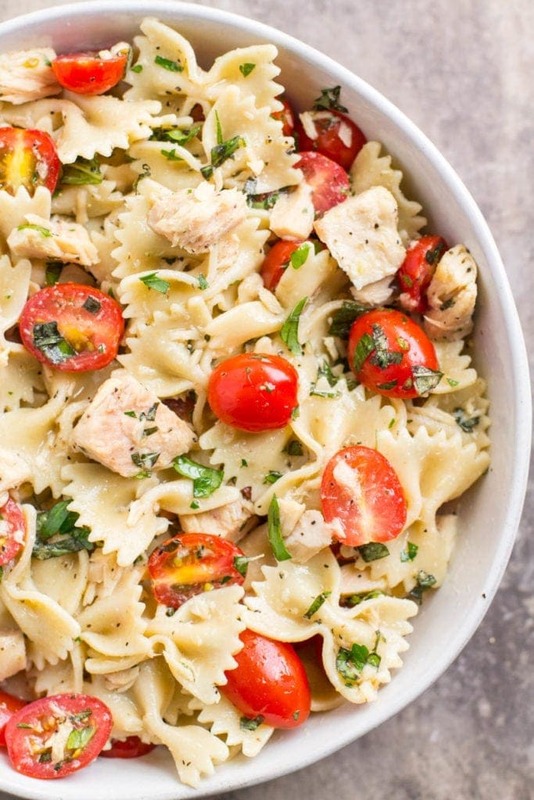 What makes this tuna pasta salad healthy? 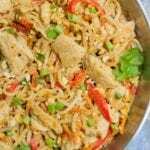 Whole grain pasta – Traditional tuna pasta salad is made with regular white flour pasta. 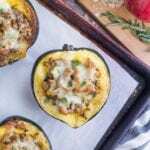 Whole grain pasta gives this recipe heartier + better for you! Minimal ingredients – This tuna pasta salad only has a few ingredients, most of which are fresh herbs + veggies! Nothing funky or processed here! No mayo – I swapped out mayo for heart healthy olive oil, making this dish lower in calories + much lighter! 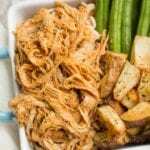 This recipe also works well with Wild Selections Sold White Albacore Tuna in Water, but I’d recommend draining it before adding to the pasta/spice mixture. Regardless of which one you use, this Healthy Tuna Pasta Salad will for sure become a staple in your house for a quick, delicious lunch or dinner! 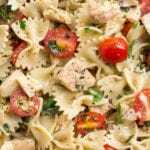 Healthy Tuna Pasta Salad is a delicious, lighter lunch! 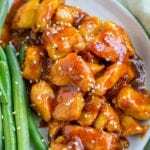 Made with only 10 ingredients, high in protein, and low in fat - it's the perfect easy meal! Made this for a quick lunch and it was SO yummy!! Super quick and easy. Yay! Love hearing that, Lucy! !